Should resale value determine your design? Conventional wisdom tells us to consider the resale value of your renovations. This can mean anything from painting in neutral colours to adding an addition you don’t want… but is it good advice? We think not! On this subject, we side with Canadian finance guru Gail Vaz-Oxlade: renovations aren’t investments. The housing market is unpredictable, and trends change in both design and demographics. If you’re not planning to sell in the near future, it’s unlikely that you’re going to reap a significant financial reward for most renovations. There are two good reasons to renovate in our opinion: first, as part of necessary maintenance on your house, and second, to improve the life you live there. As things wear out in your home, you might want to replace them, or upgrade them. So, if your kitchen cabinets sag, your toilet stops flushing, or your windows let the wind in, you will need to replace them. And when you do, you might decide you want to redesign the layout or spend some extra money on a high-grade item, or renovate some of the surrounding items (say, the floor and vanity) as well. These things will, of course, help you maintain value in your home–a functioning bathroom is better than a non-functioning one of course! But it’s simply not the case that upgrading functioning kitchen and bath are going to increase your value significantly more than their cost. And while new appliances might add value, the amount of value they add will likely be the same whether you get a regularly priced range or a $12000 one. So don’t splurge unless the splurge is purely for yourself! 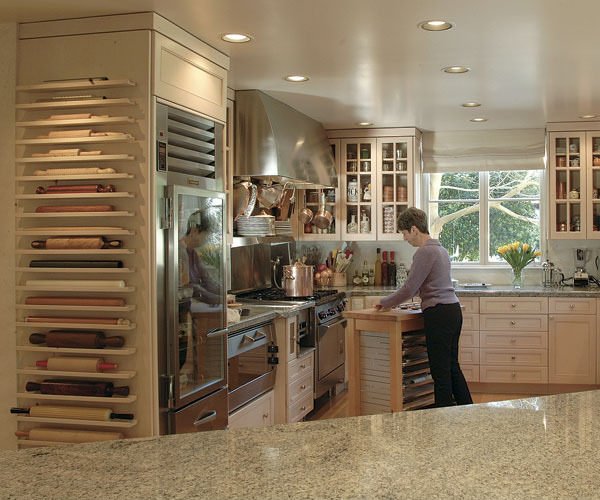 Check out Flo Braker’s kitchen below, featured in Fine Cooking. The appliances alone probably equal $50K. But, as a professional baker, that makes sense for her. She’s obviously not chosen to design this kitchen as an investment in the future sale of her house, but as an investment in herself and the life she lives. This is a baker’s dream kitchen! But it’s a bit much for me, and probably most average buyers. And that brings us to the second major reason to renovate, which is to improve the life you live in your space. If you do a lot of cooking, and your kitchen works against you, renovating it can make a lot of sense! If you have a small bathroom, and no one in your house likes baths, a large shower stall with no bathtub might work better than a combined bathtub/shower. Sometimes as we age, or as our families or circumstances change, the way we use our space also changes. What works for a family with two young children might not make sense for a family with teens, or a couple with adult children. Not all of these changes require renovation, of course, but if they do the reason is to make life more livable for you and your family or housemates, not for some future buyer. This is not a call to do any kind of extravagant thing you love without regard to cost or consequence! You still want to weigh the pros and cons of creating an elaborate set of built-in bunkbeds in your kid’s room or tiling all six sides of your bathroom in Pantone’s 2018 Colour of the Year (it’s purple. Extremely purple). Cost is going to be a factor, as is flexibility. But ultimately, if you really, really want something in your house and you can afford to do it, then the desires of some future buyer need not come into play. And if you consistently prioritize the life you live now over the future potential of resale, you may end up with features that are largely unique, but they will also be coherent and amazing.